and the geologic map to match, marked with the sites of six photos. This part of the Fan is an odd flat area, which I call the Allendale Flat, crossed by several different streams separated by low ridges. 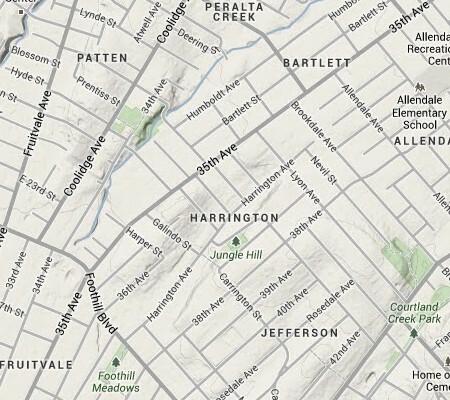 The valley of Harrington Avenue holds the Harrington Branch of Peralta Creek. The watershed map posted by the Oakland Museum of California will help keep the streams straight. As for the topography, I’ll name the ridge on the north side Harrington ridge and the one on the south Jefferson ridge (part of lobe 6 of the Fan). Harrington ridge is today’s geology puzzle. 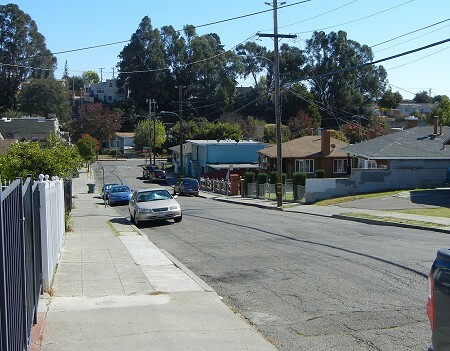 Its color stands for “Pleistocene alluvial terrace deposits,” and this is the only locality in all of Oakland, indeed the only one between Point Pinole and Hayward. It’s described as sandy gravel with boulders larger than a foot across (“35 cm intermediate diameter”). Only a very powerful river, or flow anyway, could have put such material here. My preference is to suspect a flooding event, given the dynamics of Oakland’s geologic setting: something like the sudden release of a large body of water. If you’re thinking what I am, Lake Chabot is about 5 miles, make that 8 kilometers, down the fault. At the rate the fault is slipping today (about 10 millimeters a year), the two features would have lined up 800,000 years ago. However, I haven’t seen any of this bouldery gravel because it’s covered with homes and yards. If anyone is excavating in the area, let me know. 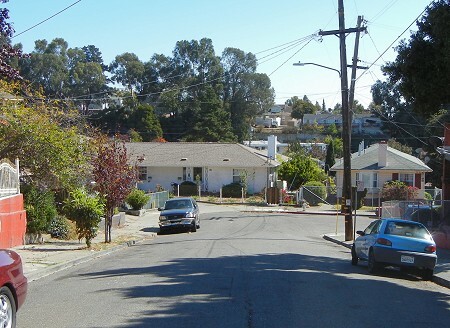 This view is looking from Harper Street, on Harrington ridge, across the valley (behind the front row of houses) at its lower end. 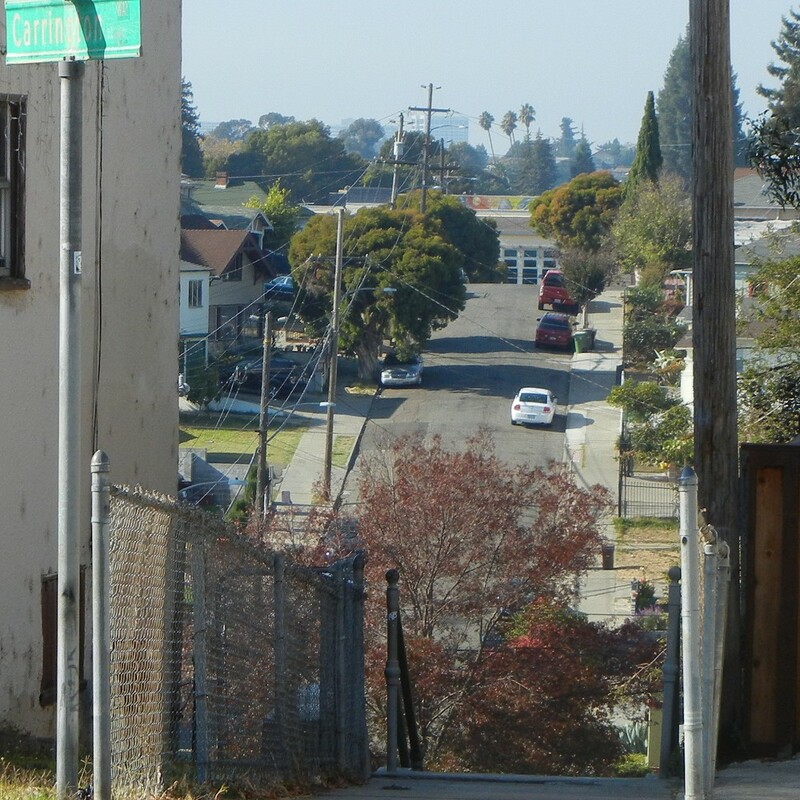 This view is from the top of Harrington ridge a block farther up, on Galindo Street. Looking straight down the left-hand sidewalk, across the creek, you may see the long stairway of Carrington Way climbing Jefferson ridge. And this is the view looking back from the top of that stairway (click to see it big). This next shot is from a point behind the previous one, zooming in on Galindo to show the crown of Harrington ridge (click for a big version). Note that it’s slightly lower than the rest of the Fan’s high points. The building with the colorful roof is the United for Success Academy on 35th Avenue. 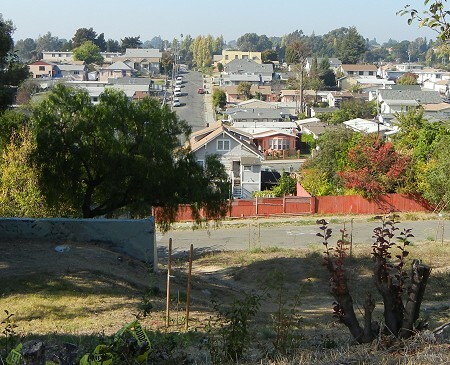 The four palm trees behind are on Galindo on the far side of Fruitvale Avenue, in the floodplain of Sausal Creek. The trees in front of them, I believe, are on the grounds of Patten University, across Peralta Creek. Behind them all is the Kaiser Center building, 3 miles away. This next view north is from one more block east, looking up Gray Street across the informal park called Jungle Hill. At least four homes used to sit here before landsliding took them out in the 1930s. (All I know about this is in a MacArthur Metro article from 2007.) Harrington ridge is relatively even lower here. And here’s a view looking almost due north across Jungle Hill and the upper end of Harrington ridge. The valley fades out of existence pretty rapidly as Harrington Avenue climbs out of it and enters the Allendale Flat. 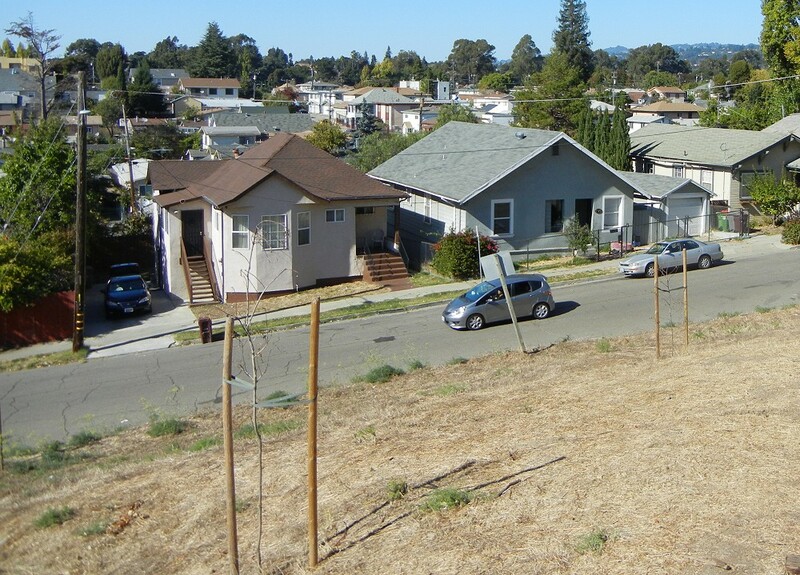 And there on the far right, as always, are the two ranks of high hills, one on each side of the Hayward fault. 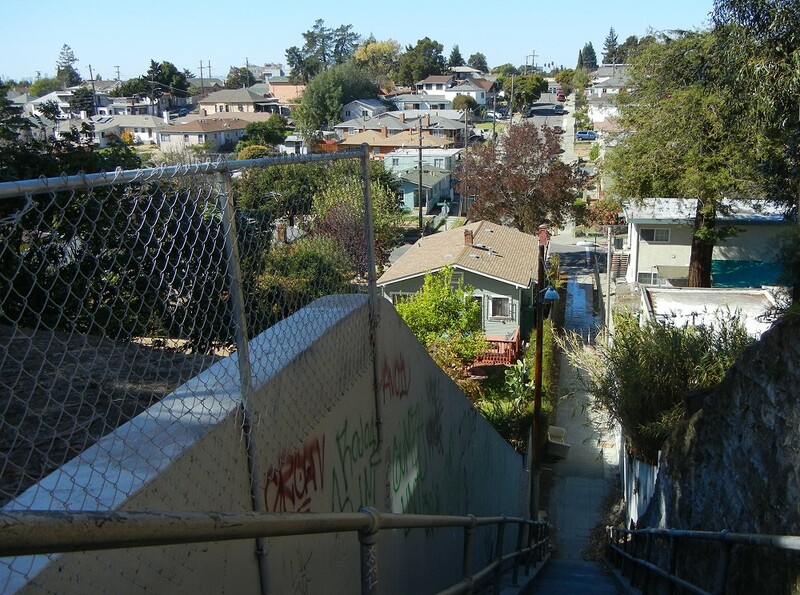 If you pick your spots carefully, Jefferson ridge offers a satisfying set of views around mid-Oakland. 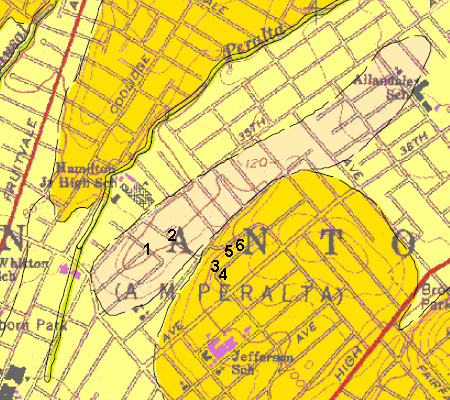 This entry was posted on 22 February 2014 at 8:52 pm and is filed under Oakland geology puzzles, Oakland's soil, the Fan. You can follow any responses to this entry through the RSS 2.0 feed. You can skip to the end and leave a response. Pinging is currently not allowed.